The Mini-Division model I won. This is the little brother to the bigger Division. The is a flipper style semi-custom knife made by Jason Brous of (brousblades.com). What a beautiful knife! So I am a guy who NEVER wins anything. Except for one time in Vegas when I had a horrible day at the U.S.P.S.A. Nationals, got stood up by friends, had nothing to do and decided to drop a $20 bill into a slot machine. I walked away with $200 and never looked back! But other than that, I just don’t really win stuff. Until now. 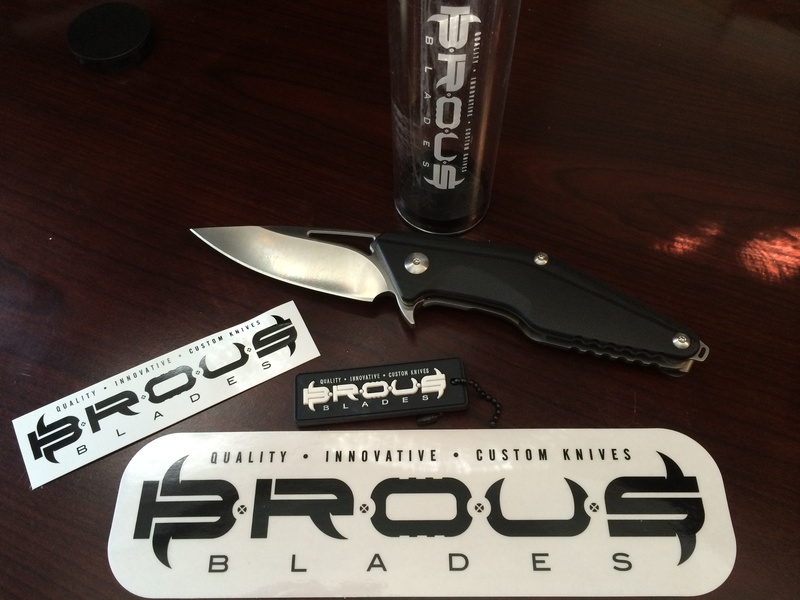 While on Facebook the other day I stumbled upon a post by Brous Blades Facebook page (Jason Brous) that offered an entry into a contest for a free “Mini-Division” model knife that he was promoting. The knife was so sharp looking (no pun intended) that I immediately jumped onto the website and read about some of Jason’s work. I also made a comment on the post about how nice the knife was and certainly never though I would win the giveaway. Much to my surprise, a day later I was getting a message from Jason that I had won, and a week after that a neat little package arrived via U.S. priority mail. The package arrived and contained not just the beautiful knife, but a certificate of authenticity, keychain, and some cool stickers! Now, in the past I have always appreciated what I have heard called the O.O.B.E. “ooobey” of a product. The term stands for out of box experience, and in marketing lingo (the little I know), is significant in terms of repeated purchases. The better a customers experience when they open the package, the more their initial satisfaction is cemented in their mind. 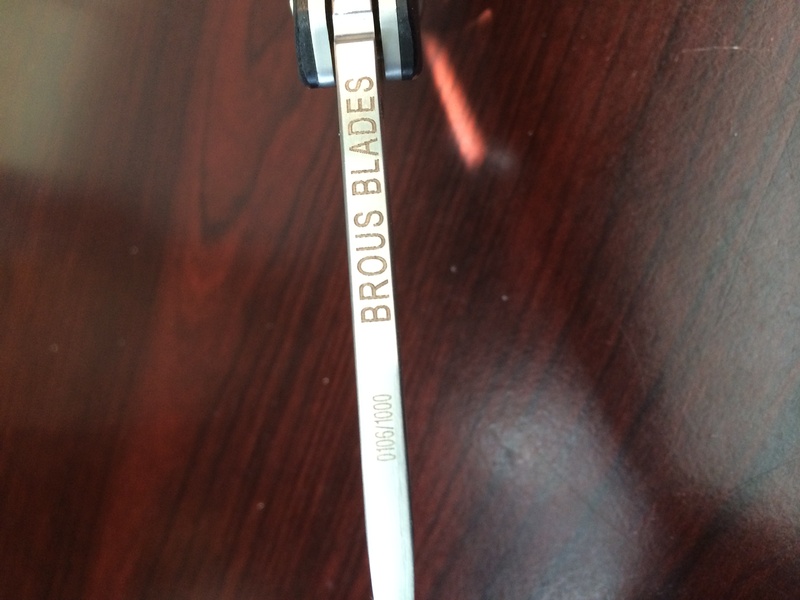 Let me tell you, Brous Blades does a great job of packaging. The knife comes in a slick protective tube that contains the knife as well as a Brous key chain, numerous cool looking stickers, small flier of other products, and a small certificate of authenticity. Enough about the packaging…I know you’d rather hear about the knife. A bit more background on me and the other blades I own. I don’t buy custom/semi-custom knives. Not because I don’t appreciate them, but I tend to treat my knives pretty hard. I know this may offend some knife snobs, but I have in demonstrations used my knife to clear a stuck piece of brass out of the chamber of my rifle rather than quit on the drill (a serious simulated phase II malfunction during a live fire drill). The knife used was a wave opening Emerson knife…which I absolutely love, but like I said… is treated a bit rough. The flipper is a prominent part of the blade that makes the knife very easy and fast to open by pressing the “flipper” into the knife handle with the index finger. Different than my wave openers, but VERY fast with some practice. Having admitted that, I must say that receiving my first custom (Jason actually calls the model semi-custom) folder, I was highly impressed. The blade is heavy and opens incredibly smooth with the flipper. 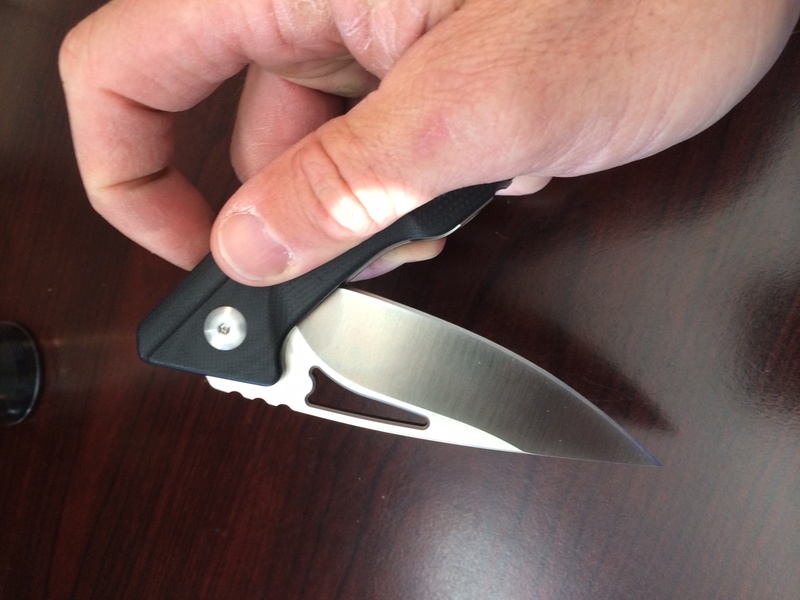 I copied some the specs of the Mini-Divisions bigger brother the Division since they are essentially the same knife: “The satin finished D2 steel blade utilizes as an integra ted flipper for quick blade deployment on a ball bearing pivot system. The drop point profile will feed material into the blade while a high hollow grind that provides a very keen edge. A slim profile allows for easy carry and gives the knife an extremely effective point.” The blade length of the Mini-Division is a 3.5″ versus the bigger knives 4.37″ long. In addition the knife is “featuring a titanium liner lock system that is carbidized with tungsten carbide providing a hardened lock face surface that eliminates stickiness. Stainless steel standoffs and flow-through construction make for a light weight, durable, and easy to care for large folder. With the added versatility of a reversible, deep carry, tip-up pocket clip, this will be the blade that you reach for when carry duty comes calling.” I absolutely love the look, design, and feel of this knife in my hand. The flipper mechanism makes opening the blade almost automatic. Serial number on the blade. Mine was number 106. Maybe not fancy to some of you…but I appreciated the serial number on the blade! I have never owned a knife with a serial number (that I know of). And by the way, the thickness and grind on the blade is incredible. Jason offers a lifetime guarantee, simply return the knife for repair if you ever have an issue. Jason is unique in his artistic approach to knife making. The website mentions that he initially released his first design in 2010 and much to his dismay was assaulted by the armchair internet commandos that all know more. The result was a dedication to stick to his principles and “turn that criticism into fierce determination.” Which in the end, worked out for me! I am the proud owner of a beautiful, semi-custom folder that is one of the nicest blades I have, and will probably ever own. I have to admit though, I am hooked and you will likely see more Brous knives in my collection in the future! Maybe I can get him to make something unique to the Shooting-Performance brand…. ← Want To Be Better Competitive Shooter? Ten Things You Can Do Right Now!